ROME – Italian taxpayers will not see their tax burdens fall any time soon, as the government is still focused on improving its precarious fiscal position. On August 16th the Prime Minister of Italy Mario Monti issued a statement dispelling current rumors and speculation that the government intends to boost economic growth in Italy by slashing income taxes in the near future. The Prime Minister’s statement came a day after reports were released by the Italian media claiming that the government would announce and implement several tax cuts prior to the upcoming national elections, which are scheduled to be held by the April 2013. The Prime Minister conceded that the tax burdens faced by businesses and individuals in Italy could be regarded as excessive, but he also said that Italy is not currently in a position to reduce tax rates as the government is still focused on its efforts to improve public finances. 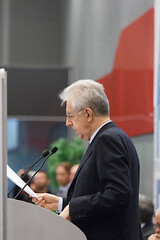 Mario Monti explained that cutting tax burden in Italy is a “sacrosanct necessity” and is still one of the main long term objectives of the government, but at the current time it is still too early to “distribute the benefits” of the government’s efforts to improve its finances by cutting income taxes.